If you’re like the rest of California homeowners, you’re probably feeling the heat of rising utility costs. So what should you do? You can accept it and continue to pay as the cost rises, or you can look for an alternative energy source. At West Coast Solar, we believe renewable energy is the future of power generation, consumption, and storage. 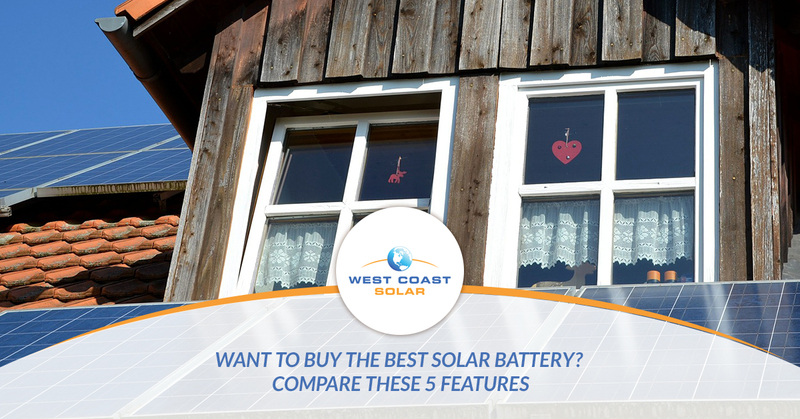 That’s why we’re going to share the five definitive features of solar batteries to look for in the following post. Whether you have a solar system or not, a solar battery purchase may be advantageous for your current energy situation. How To Compare Solar Battery Options? It may look overwhelming when shopping for your solar batteries, but if you look for these five features, you can determine which energy storage option is best for you. A battery with a high power rating can deliver a lot of electricity, and a low power rating means the battery is going to deliver a smaller electrical charge. When you add in the battery capacity, you can determine the amount of time the battery will deliver the charge it’s rated for. For example, a solar battery with a high power rating but low capacity could power your home but only for a few hours. A battery with a high capacity and a low power rating could power a select few appliances over a day or two. It’s important to know how you want to use your solar batteries for before you start deciding on capacity and power ratings. The DoD of a battery simply means how much of it can be used before it needs to be charged again. For example, a battery at 10 kWh with a 90 percent DoD means it will need to recharged after 9 kWh are used. Many manufacturers will offer provide information on what the optimal DoD is for optimal use with the chosen battery. This feature simply shows how much of the energy you used to charge the battery to power your home, appliance, or car. For example, if you use 10 kWh to charge a battery and get 9 kWh energy use out of that charge, you have a 90 percent round-trip efficiency (9 kW / 10 kW = 90%). In most cases, you will gain more economic value out of batteries with higher round-trip percentages. Your solar battery is similar to your phone battery. As you use it throughout the day, the charge lessens. When you recharge the battery each time, the energy the battery holds gradually decreases over time, making the battery less effective. Solar batteries work the same way. You want to compare the features listed prior to the life of the battery. A battery with a high power rating, an above average capacity, but a short life may not fit your energy storage needs. Consider all your options before purchasing your next battery. You definitely want to check a potential solar battery for the type of warranty it carries. For example, a battery may have a warranty for 2,500 cycles or five years at 75 percent of its original capacity. It’s like purchasing a warranty for a new car. The warranty offers 3 years or 30,000 miles of coverage. Battery warranties work in a similar fashion. Your priorities with energy storage should influence how you choose which battery manufacturer to trust. In most cases, a reputable manufacturer with a tenured history in battery production is a safe bet. However, you may want to try a revolutionary battery technology developed by a startup. You may be able to find the same vehicle manufacturer you love and purchase their version of the solar battery. It’s all about how you prioritize your energy storage when it comes to solar battery manufacturers. We serve more than 20 counties in California including major cities like Sacramento, San Jose, and the Greater Bay Area. If you’re still deciding on which solar battery to purchase, give us a call. We offer home battery services and guidance to keep solar simple for you.